I was doing a bit of a practice session last night. Although not great video from my iPhone, I just wish I could get rid of the 8s that always seem to appear on the last shot. Well, if you hadn't picked on the eight so much on the first target (you completely obliterated it) it probably would have left you alone on the second one. "I just wish I could get rid of the 8s that always seem to appear on the last shot." As my very literal daughter would say... then don't take the last shot! I wonder why the video is wavy - was the phone sat on something moving? Heh, better to be warm and the camera shake than cold and the shooter shake! My take on the last shot flier in a series problem is that most of it originates from trying too hard. You see a nice group and you think about it. Thinking about it takes the imagination in the direction of 'I'm on track for a personal best score.' Pressure builds. Suddenly you're trying to hold the 10 in your sights instead of repeating the pattern you've been training to repeat. You think yourself into breaking form. That's the time to put down the pistol and take a few breaths with eyes closed, to visualize what shooting a 10 looks like, how long it takes to achieve a good hold without holding so long you start shaking or jerking the trigger to grab that last trace of the 10 as it vanishes into the void of your ever-widening arc of movement. Once you've gone through the routine mentally a couple of times, open your eyes, pick up the pistol, settle into your stance, and reproduce what you just imagined exactly, without hesitation during the cycle. If tension returns, put down the pistol and repeat. You've got time. The interval you're shooting at is somewhat short, for that many shots in so short a time. 8 or even 10 minutes for 10 shots is just fine. I find the contradiction somewhat problematic. What I mean is the apparent conflict of interest between scoring well, shot after shot, and the desire to feel like I'm part of the process, to actually fully experience the shot. It seems one can't do both and succeed. A kind of mindlessness is essential to excellent shooting. Upon reflection, after a session well shot, that's when one can begin to apprehend the accomplishment. 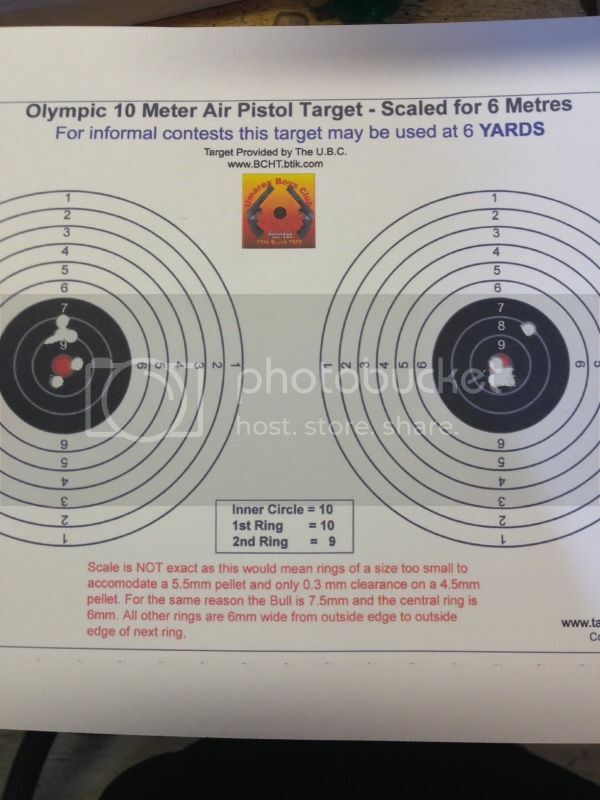 But during the process the ego must be removed as much as possible from the equation as it gets right in the way, interferes with the shooter's ability to just watch that front sight and let the finger do its own thing on schedule while the sight is in the area desired on the blurry target. It's very meditative, when you're doing it right. As in semi-conscious. 'Needing' a 10 is almost certain to eliminate a 10 from possibility. Exactly so. There's a weird difference between losing concentration and shooting badly, and entering that state where you're somewhat removed from the shooting, but fully focussed and shooting really well. Once you get into thinking about that new personal best it all goes to hell in a hand-basket. I wish I was better at getting into the zone, and able to sustain it for longer. Typically I get a run of 10 to 15 shots out of a 60 shot session. I think half the problem is having to change targets and realising that it's going well. That's usually enough to end it. Every other day you must practice to be consistent! In essence it seems my daughter would be right to say don't take the last shot in this sense..... if you think of it as the LAST shot in a good string and put all the aforementioned pressure on it then you may go wrong, however, if it is just another shot in a good string , taken in the same manner as the previous shots then it may do better. I wish I had the time to really get into the zen/psychology/physiology of the shooting process in progressive sessions. Someday perhaps but still happy/grateful with what time I do get shooting. One thing about my shooting space is that there are A LOT of distractions(you don't want to see it). Its not a large shop ( 16 x 24 ) and its about 80% full. 2 Motorbikes, SxS, work tables and desk all the way around the outer edges and the necessary tools of man. And the whir of the heater. Not making excuses, but it is something that Im sure there are a lot of guys trying to overcome while shooting in their own spaces. Im back in this sport after approx 25 year absence and thoroughly enjoying every chance I can get. And with the UBC and postal matches it has been that much better submitting score and trying to better myself each round. Concentration and taking your time to focus on your task will produce the desired outcome. Im in NE Alberta and this is not the shooting sport of choice, so I only have online folks to get educated and take all the tips and hints I can. Enough rambling, HAPPY NEW YEAR and good shooting to all. I do a similar thing. I am working on not getting frustrated. I forget the last shot. What helps is having multiple small targets that I only shoot one each. One shot per target is certainly on the right track. At international competitions that's how it's done. At local matches we shoot 2 per target to save costs, and I find that even there my mind jumps too easily to focusing on how the first shot went then trying to do better on the second. And more often than not it works against me and the second is worse. So many coaches have said the same thing - shoot every shot as though it were the whole match, then start over for the next one. That way you're shooting a 60 shot match as though it were 60 independent matches, and no playing at catch-up or retaining a good streak gets in the way. Of course this is the hardest hurdle, but one worth pursuing. So true. I find a lot of shooting is in my head. And if you knew what was going on up there I'm surprised I can even hit the paper never mind the targets. Shooting really is in your head! Visualization is most important! The mechanics or muscle memory is the easier part.